Sharinapro is a blog about gossip and rumors of Hollywood, Bollywood celebrities with their latest update including information about technology and education. Celebrity Gossip and Entertainment News, Covering Celebrity News and Hollywood Rumors. 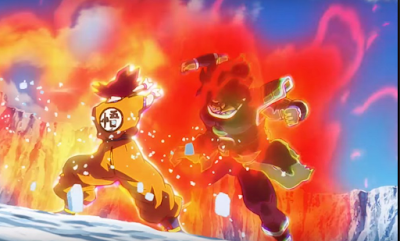 Dragon Ball Super: Broly changed a lot about what fans had previously known about the Dragon Ball franchise, and it added a lot of new ideas for many of the series' mainstays. This is especially true for the Super Saiyan God form, which got a pretty big focus in the film. The series has seen Goku and Vegeta debut new techniques pretty much on a whim, and that's absolutely true for Dragon Ball Super: Broly as well. When Vegeta uses his Super Saiyan God form against Broly, it's ultimately because he's disappointed with how the fight had been going up until then and wanted to end it quickly. As a way to further taunt Broly, his first attack against him is to launch a few bursts of air. Rather than ki blasts, these air attacks act as ki blast and pelt Broly as energy would. This knocks Broly back until Vegeta sends him into the sea with a bigger blast later. When Goku uses the Super Saiyan God form, fans see two new skills in action which involves Goku gathering his God ki into a sphere in the palm of his hand and he flies toward Broly. He attempts to hit Broly with this ki ball, but Broly is too strong at that point at completely closes his palm around Goku's attack and defuses it. The second new technique is a bit more effective, and provides a bit of a breather in the intense fight so far. Goku taps Broly's arm, and then gathers ki within his hands. After this, he brings Broly to a complete halt as his God ki encompasses Broly. Goku is able to hold Broly there for a moment (while trying to calm him down), and this technique works well enough until Broly adapts and wraps his own ki around Goku, essentially bouncing the effect back onto him. Not only did Dragon Ball Super: Broly treat the Super Saiyan God form with a greater reverence than the later parts of the anime series, but it revealed Goku and Vegeta still have a few tricks up their sleeve when it comes to using the god ki in this form. Hopefully the series comes back someday to expand the powers of Super Saiyan God even further. Boku NO Hero First-Look at Its Next Big Villain.